As small or medium sized business owners with limited budgets, every dollar that you spend on marketing your business counts & needs to be measured like such. Spending time & money doing any kind of work without properly tracking your results will put your business on the fast track to nowhere. Most small and medium-sized business have accepted the fact that they need to use social media marketing to promote their business. Some have even done a good job of posting regularly and building a following. But what happens next? People fill their bucket with new prospects, new potential clients and then… They completely drop the ball. Most businesses have what I call a “leaky bucket” and it may cost them their business. They promise to get new customers into the top of the bucket, but they have no solid follow-up system after that and the would-be great customers slip right through the empty holes. When prospects are shopping for a product or service, they will likely enter a consideration phase. This might mean closing out of your website in order to “think about it.” Great marketing ensures you stay in their mind by retargeting buyers around Google and on platforms like Facebook & Instagram to remind them that you are the best choice possible. You can also use retargeting ads to address any questions or concerns they might have. Retargeting ads are a core irreplaceable element for any existing successful business because they actually work. Existing customers are the most valuable asset of any business. They are the most likely to buy again and, on top of that, if they had a good experience they will tell all of their friends and family. And by “have a good system” I don’t mean a random email newsletter twice a year or an Instagram post. If you are serious about growing your business, paid advertising is an essential way to keep in touch with past customers and increase your bottom line. The reality is, almost any ‘Jo Shmo’ can post to Instagram and Facebook. Posting is great, but it posting in itself isn’t a strategy that you can depend on to make you money. Why? Because organic reach is all but dead. Social media is pay-to-play now, so without putting a few ad dollars behind your accounts, you are likely to keep hearing crickets. With that said, a good social media strategy involves the use of paid advertising platforms like Facebook, Instagram, and Google PPC – usually a hybrid of all three. But, don’t get turned off by the “paid” part. This is an amazing time in history to have a small business. Sophisticated platforms like Facebook & Google have made it possible to reach the right person, at the right time and with the right message for a very small ad budget. Small business has access to huge audiences – it just takes the right strategy to reach them. – Your business objectives & what you hope to gain out of the relationship. You don’t have to have it all figured out, but the more specific you can be about what your expectations are for growth and return on investment the better. – Can the social media specialist provide a clear growth strategy that shows a valid understanding of your industry? If you are in the process of looking for an agency, Oregon Web Solutions would love to discuss earning your business. In fact, we offer a completely free strategy session for your business. Whether you choose to work with us or not, you will take away tons of valuable information. Secure your strategy session today. Social media has emerged as arguably the most important aspect of your social media strategy. Over the last few years, the popularity of social media has exploded making it essential for business owners to understand and use Facebook, Twitter, and Instagram effectively. 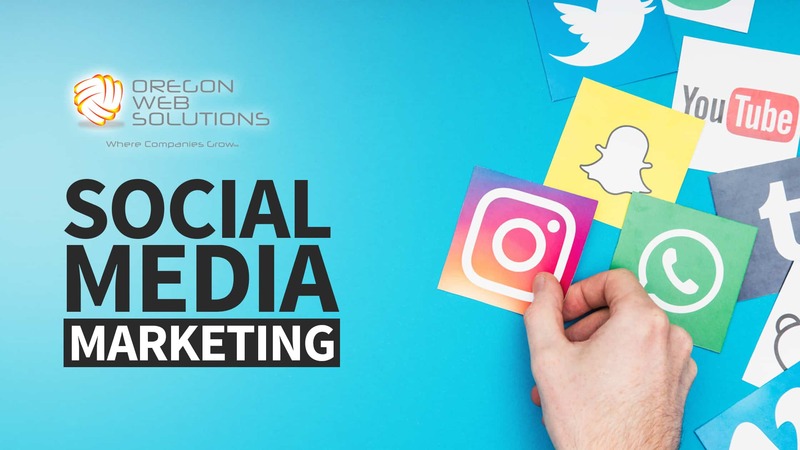 At Oregon Web Solutions | Digital Marketing, we can help you create and manage your social networks to engage your audience and reach new customers. Many business owners struggle with running their social networks because they are focused on running their business. This is one area where it definitely pays to delegate your online social marketing strategy to a professional social media marketing companies. Oregon Web Solutions is up to date on the best strategies and tactics that will drive more customers to your website. Plus, when combined with targeted Google traffic it can open up an entirely new revenue stream that otherwise would have gone to your competitors. One of the biggest mistakes business owners make is to ignore their online presence. Recent studies show that it is now more important than ever to make your online presence look professional. The bottom line is most new customers will review your company online prior to doing business with you. If they have a hard time finding your information, website, or social media pages, there’s a high probability they will go with your competitor. Furthermore, when your online presence looks professional and modern your conversion rates will skyrocket. At the end of the day, it’s all about making more profit. When used properly, social media marketing can be a powerful tool to grow your business and retain old customers. Our social marketing strategy includes Facebook, Instagram, Twitter, and YouTube. Through a combination of consistent posting, and audience engagement, we can help you reach new customers. In the year 2018, it’s absolutely essential that you take advantage of the great opportunity social media provides. Contact us today to get started. Ready to make more money? Take 5 minutes to Fill out the Discovery Form today! Search Engine Market Strategies And More…. Social Media Marketing Portland Oregon	Overall rating:	5	out of 5 based on 48	reviews.